The BG MBB wrapped up the non-conference portion of the schedule today with an easy win, as expected, over Tennessee-Martin. BG finishes the pre-season 8-5 with 7 straight wins at the Stroh. I believe I saw somewhere that it was 2001-2 since BG opened 7-0 at home. The final was 94-80 but the game was not that close. The first 13 minutes were competitive, but BG outscored the Skyhawks 25-9 over the last 7 minutes of the first half to lead by 16 at halftime. The second half was never competitive, with BG leading by over 20 most of the way and then leading by 27 with 3 minutes left before the Skyhawks made some baskets against the BG bench to lower the final margin. 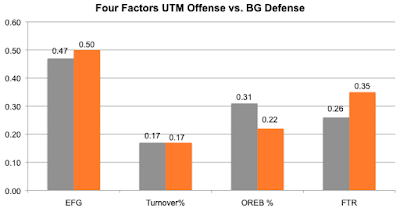 The preview had noted that UTM struggled to defend the shot, and BG pretty much shot it where they were used to defending. BG shot 50% from 2FG and 45% from 3FG, a combo that's going to make you hard to beat. 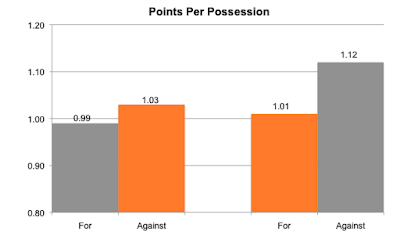 BG's 1.23 points per possession was its best of the year. 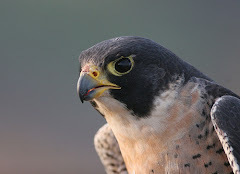 The Falcons also took good care of the ball, and had a dominating game on the offensive glass. The preview had also noted that UTM didn't foul much, and they actually shot more FTs than BG. The Falcons were 10-15 from the line. Last note, UTM played a decent amount of zone and BG was able to hit from the outside and pull them out. On defense, BG defended well most of the way. You saw the energy and communication and switching. The Skyhawks shot 42% and 36%, so a below average day. They took good care of the ball, BG did a good job on the defensive boards against a team with strong offensive rebounding and as noted UTM did OK getting to the line. The individual star for this one was Caleb Fields. He scored 24 points and made 8 of 11 overall and 6 of 7 from distance. He added four assists, all in 28 minutes. Wiggins was back on the double-double train, scoring 20 on 8 of 13 shooting and adding 13 rebounds. He had 4 assists over 1 turnover. Antwon Lillard came off the bench for 14 points on 5-9/4-5 shooting. Justin Turner had 12 points on 5 of 9 shooting to go with 6 rebounds and 6 assists. Dylan Frye had 7 assists. BG finishes the calendar year on a 4-game winning streak. Next up is Kent on Saturday. It will be exactly one month since BG last played on the road, where they looked like a much different team than this one. Kent will be an excellent test of whether they can take this success on the road against a much better team. BG rounds out the non-conference schedule with the Tennessee-Martin Skyhawks at the Stroh. This is our first matchup with TN-Martin, so let's get to know them a little bit. Martin is a town of about 10,000 people in northwest Tennessee, not too far from the Kentucky border. The nearest notable town is Paducah (60 miles or so) and Nashville and Memphis are a couple of hours away. It is the home of the Tennessee Soybean Festival. The town's most notable native--by far--is Pat Summit, perhaps the best basketball coach to ever live. She also attended TN-Martin. The university has about 6,000 undergrads. Their nickname used to be the Pacers. They switched it to Skyhawks---way back they were the Sky Pilots, either due to a frontier term for a preacher or a testament to the pilot training during WWII. They have varsity rodeo and equestrian and actually won a national championship in rodeo. They have not played in the NCAA tournament. They won the OVC in 2009 and played in the NIT. They have played in the CIT tournament in 2015, 16 and 17, making the semi-final in 2015. Their coach is Anthony Stewart, who inherited the last of those CIT appearances and is 15-26 since then. Stewart went to Mount Union and was an assistant at OU just before taking an assistant job at TN-Martin. They are picked to finish 11th in the OVC this year. Their kenpom right now is #308 out of 353. They are 5-5 with 2 non D1 wins, with the best being over #284 UNC-Asheville. They have lost only one top 100 game (Fresno State) the rest have been pretty soft losses. They have yet to win on the road. The Skyhawks play at a fast pace, with the 66th highest tempo in the nation, which should match up well with BG. So, here's the basic match-up. They are below average on offense and very poor on defense. That's the #235 offense and the #334 defense in D1, out of 351. The D1 average this year is 1.026, so BG is about average on defense and sub-average on offense. BG starts out the game with reasonable advantages on both ends of the court. When the Skyhawks have the ball, we can see the biggest weakness is that they shoot poorly. They shoot 49% from 2FG (slightly below average) but 29% from 3FG, which is #317 in the country. They take just below the normal proportion of 3s, so that kind of shot mix with that kind of percentage is going to make it rough. They take good care of the ball, are good on the offensive boards and very rarely get to the line. When they do get their, they make 69%. 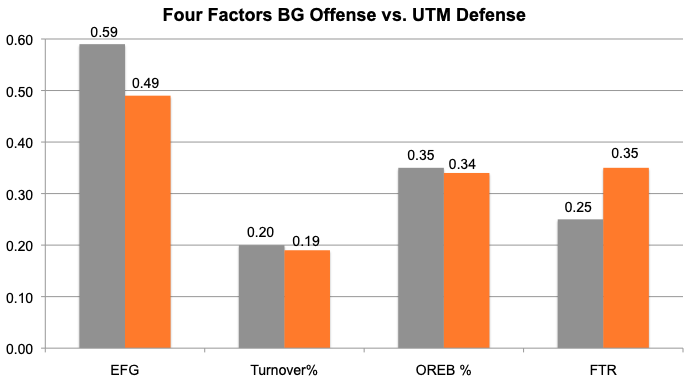 BG's 3 defense has been improving over the last games, so you'd hope to see the Skyhawks clamped down pretty well. Plus, because they are more one-dimensional, you can adjust a little. The battle on the boards should be good, too. On defense, here's what you have. UTM is terrible defending the shot. That's among the top 20 worst in the country. They allow 63% on 2FGs, which is third-worst in D1. Their 3FG defense is 36%, which is below average, but not by as much. Also, they do not allow people to the line...they are #22 in the country in that. Just to say this....as well as BG has been playing and shooting at home, this would appear to be a good match-up for us. The Skyhawks have five double-figure scorers, but remember that fast pace. Their leading scorer is Derek Hawtorne, a 6'3" JUCO transfer. He's scoring a rough 13 a game, shooting 43% and 33%. He also leads the team with 5.7 rebounds per game. Preston Parks, their second-leading scorer, joined them mid-year after transferring last year from The Citadel, where he was the FR of the year in the Southern Conference. He's shooting 33% and 38%, so also rough. He has 33 assists in only 7 games. Quinton Dove is scoring 11 PPG on 60% shooting in 20 minutes a game. He's 6'8". He was a highly ranked player at Cuyahoga CC. Kevin Little is scoring 10.6 PPG on 33% and 29% shooting. He leads the team in 3FG attempts. He's a transfer from Colorado State who sat out last year. Delfinko Bogan leads the team with 4.2 assists per game and over 3 A/T. He also has 19 steals. So, this is a game BG should win. These games after Christmas can be dodgy...it's a long layoff and some time away from the game. Kent certainly struggled last night. Having said that, BG should make this a 7th straight home win. When the 2018 football season started, the proposition for success was simple. The defense would probably not be much better, but hopefully not worse with a regime change, and the offense was going to be a powerhouse...our offensive genius head coach would put all the pieces together and BG might end up in some wild shootouts but they might also be able to win their share of them. As noted already, the defense got better. Not a lot, but it did improve. The offense did not come anywhere near delivering on its end of that proposition--which was nothing less than it would carry the team. The offense ended up doing no such thing. As you can see, BG's scoring was way down. The Falcons were in the middle of the MAC in 17 and you figured they needed a top 2 or 3 to make the overall proposition work, and it just didn't happen. BG fell to 9th in scoring. (These stats are all MAC games only). The yards per play was OK...falling just .1 yards and one place in the standings. Again, though, with most of the guys back and an improving line, you expected to take a jump. Furthermore, the culprit is clear. The passing game was better, but probably not where it needed to be. BG was #3 in passing efficiency, which is a formula based on different stats. TD passes were down in the MAC....BG went from 18 to 19 but 19 was the tops in the MAC. In the spread/air raid offenses, completion percentages are really important. For reference, in 2015 when BG had the top offense in the MAC, BG completed over 70% of its passes. By comparison, the 2018 Falcons had 61.6% completions, up from 57% the year before. Relative to the conference, BG stayed 5th in completion %. The next thing you want to look at is yards/completion. You can up your percentage pretty easily by throwing the ball behind the line of scrimmage on high percentage passes, but it normally impacts yards/completion. As you can see, BG went from 12.3 per completion to 12.2, moving from 9th to 6th but still not an elite MAC offense. Similarly, BG went from 11th in INT rate to 5th. Better, but not the jump we would have needed to have the offense carry the team. So, the passing game went from below average to above average. The real culprit was the running game. BG's yard per rush went from 4.8 to 4.0...from 3rd in the MAC to 9th. In other words, the running game got worse where it had to get better or at least stay where it was. Rushing TDs were also down. There are a couple of ancillary stats. For example, BG gave up sacks on 6.5% of its passes the year before and it was essentially the same this year. Put that with the rushing and I think that one thing is clear. Coach Jinks created unrealistic expectations for the offensive line, which was returning largely intact but was still young. So, the passing game is the same or a little better and the running game gets much worse and you have an offense not able to fill the role that was expected. One last note: the offense was the last part of the team still coached by the original assistants. That's the last thing about that. So, I'm on the couch in the family room watching the Boston College game, something I suspect many BG fans are doing today. One thing I think people are watching for is to see the Loeffler offense. What you are seeing is a pro-style offense. If you have been watching, you've seen the formations entailed in that. BC has been under center and they have generally be in a 12 or 22 personnel group. Just as far as that goes, I think it has been pretty rare for BG to be in a 22 since Clawson was here and that's even partly true of a 12. I found a couple articles about the offense. First, here's one about the pro-style challenging the spread for popularity and here's one from a Virginia Tech blogger extolling the virtues of the offense Loeffler himself was installing. The pro-style is designed to be a balanced attack. You balance run and pass and there are a lot of play-action passes, as opposed to a reliance on RPOs. The offense uses TEs and a lot of them. That's why the Joey Carroll signing was so important, because BG went to a Babers offense where you literally need no TEs to this one, where you might have 3 on the field on certain plays. Coach Loeffler has talked about how you can challenge the defense with different formations out of the same personnel group. For example, you might be in 12, but split one or two of the TEs out and make them into slot receivers. The defense can put a set of players onto the field for a specific personnel, but they don't know the formation and it can create match-up issues. The offense also requires a line to be equally adept at both run and pass blocking, and if there's one part of the team that might have adjustment issues, that could be it. Also, switching to being under certain can be an issue for a QB. It is more different than you might think. Who plays this attack? Michigan. Texas A&M. Stanford. Boston College. Virginia Tech. Georgia. Alabama. There are people who aren't crazy about a pro-style attack. They feel it doesn't take advantage of the full field, can get sluggish and also be less effective when you are behind. You certainly hear criticism of the Michigan offense, for example, for being rigid and undynamic. It pretty much has to be paired with a good defense. Because it is more time-consuming than spreads, it can pair well with a bend but don't break defense. One last thing. Obviously, you will see spread techniques in a pro-offense. More importantly, you can play with pace from any formation and attack. So, to the extent that you are capitalizing on a matchup, it is possible to force the defense to keep the same personnel and yet vary the attack. I have often said that my favorite kind of football is the one where we have more points when the game ends. Clawfense, spread, pro-style, Baylor...doesn't matter to me. I think pro-style could be a good fit here for a couple reasons. First, it transports well to November. Also, it might fit the type of ball played by Ohio and Pennsylvania HS kids. It is more of a power offense, which should help in the red zone and when killing clock at the end of the game. In the end, you have to get the ball to your players in space, and that is true of all offense. Well, they're in a weather delay now in Dallas. Another MAC bowl season has ended with disappointment for fans of this conference. The MAC placed 6 teams in bowl games, with five and possibly six of the games against G5 teams (depending on how you count BYU) and the MAC had another poor season, going 1-5 for the second straight year, and that one on top of a bagel in 2016. It's not a real, huge big deal--these are exhibition games. On the other hand, they are opportunities for us to compete against peer conference (mostly) and we haven't been getting it done. Yes, I know there's a long layoff, etc, but that impacts the other team as well. There were certainly winnable games. EMU had the opponent in a 4th and long, literally one play from a win and lost. UT lost by 3. On the other hand, NIU and WMU lost big and Buffalo was competitive but played an uncharacteristically mistake-prone game. Only OU--with Frank Solich--won. And it was two years in a row for them. Here are the records for the next five years. Again, we're not getting pitted against top flight teams--these are good matchups and the conference is just not good at winning them. One of the things that has been frustrating for MBB fans (and football fans) is that not only have the teams been average at best, but they have tended to struggle to win at home. You'd like to at least reward your loyal fans with some wins, rather than playing better ball away from home. Bowling Green has started a season 6-0 at home for the first time in Stroh Center history. The Falcons last started a season 6-0 at home in 2008-09. Bowling Green has won all six home games in 2018-19 by 10-plus points. Prior to this season, the last time BGSU won six-straight home games by double figures was 1996-97. Our preview noted that BG was playing a relatively soft pre-season schedule. Kenpom ranks our schedule at 285 out of 351. The Green Bay win stands out as proof of performance to some degree...anyway, the first step to being a competitive team is being tough to beat at home, so I hope that the Falcons are finding their way to that. The final in this one was 73-52. For most of the first half, WCU was leading a low-scoring battle as the Falcons were maddeningly unable to make zero-foot shots at the basket. With about fout minutes left, Justin Turner broke a mutual three-minute scoring drought to cut the lead to 21-19. Laster got a steal on the other end and took it home to tie the game. To recap, BG hit the 4 minute mark with 17 points and then went on a 15-8 run for the last four minutes to lead 32-25 at the break. For the second half, the lead kind of kicked around that point for the first 7 minutes or so. With 13 left, BG was up 8. A Sierra 3 was followed by a Turner steal/basket and BG had the lead over 10 and it never got closer than 9 the rest of the way. A couple minutes later BG went on a 9-0 run to get the lead over 20 and it was over. Actually, this tells the story pretty well. BG had 1.11 points per possession and held the Catamounts to .79 points per possession. BG played really good defense the entire way. They covered WCU hard, and you could just see that they had little room to manuver. They shot 48% from 2 FG and 28% from 3FG--the latter being a good number against this team, based on their past. BG shot 59% and 33%. The number from 3FG isn't great, but not awful, either, and BG was getting to the rim, which was a concern against the WCU defense. BG did not have a good day on the offensive boards but were very good on the defensive boards. BG took great care of the ball and didn't force a ton of turnovers, but they did create a couple of key baskets off turnovers, as noted above. The other big difference was FTs. WCU was called for 25 fouls and BG for 13. BG was a meh 17 of 27 from the line, but WCU was 2-8. That's +15 just at the line. Individually, Demajeo Wiggins had one of the stranger stat lines you will see. He had 11 points and he attempted one FG. They fouled him a bunch...according to the Blade, 10 times. WCU's leading scorer was in foul trouble the whole way. He made 9-13 at the line, which is 69%, and added 9 rebounds. Justin Turner can play ball, let me tell you that. When the shot clock gets low, Huger yells "Juice" and they get him the ball at the top of the key and even with the entire defense keying on him, the young man gets to the rim and finishes. Coach called him "crafty" after the game. He scored 21 on 9 of 14 shooting, 6 assists over 3 turnovers and 2 steals. Antwon Lillard contirbuted 24 nice minutes off the bench for BG. He had 12 on 4 of 6 shooting and 7 rebounds. Dylan Frye scored 9. BG got good minutes out of Sierra, Uju and Laster also, off the bench. So, the holidays are a combination of things. Coaches have unlimited time with the team, so they can work on some things. Coach said they would be putting in some new offensive sets, etc. Then, its Tennesee-Martin and into the MAC. The school is located in Cullowhee, NC, 6000 people. It has 11K students, and it would be difficult to find a better descriptor for it than "Western Carolina." On November 29, 1980, Western Carolina's Ronnie Carr made the first intercollegiate three-point field goal, in a game against Middle Tennessee State University, a game WCU won 77–70. The ball he used is on display at the Basketball Hall of Fame in Springfield, Massachusetts. They are coached by Mark Prosser, who is the son of the late Skip Prosser. Prior to that, they were coached by Larry Hunter for 13 years. Hunter also coached at OU. (Tragically, Hunter died within a couple months of retiring). This year, they are 3-10, with one non-D1 win. Other wins are Jacksonville (287) and @UNC-Asheville, (344). They lost to Wake Forest by 7, took a good Furman team into double OT, and lost by 3 to a good Charleson team...also lost to High Point (224) by 27 last Saturday. Lost on Wednesday @Iowa, 78-60. Their kenpom ranking is 306. According to Blue Ribbon, Prosser is looking to play the Pack Line at WCU. That's the defense played at Virginia...the idea is that it's man to man, but there's a line inside the 3-point line and if you're off the ball you don't go outside the line. It is designed to prevent dribble penetration and pack the middle, which could be an interesting challenge for BG...on the other hand, as we will see below, WCU is really struggling on defense. Looking at the numbers, I always say that last place teams have last place stats. As you can see, WCU is thriving on neither end of the floor. Both teams are below average on all four dimensions...currently, D1 teams are scoring at 1.03 PPP. The numbers inside that are interesting. First, WCU plays an up-paced game, essentially 72 possessions per game, right where BG is. That's unusual with the Pack Line defense, but Prosser told Blue Ribbon before the season that he is convinced you can do it. Anyway, the interesting thing is that they shoot the ball very well, they are a decent rebounding team and they get to the line. Their offense is dragged down by being second-to-last in the nation in turnovers and 5th from the bottom in FT shooting. They shoot a lot of 3s. In total, 47% of their shots are 3s, the D1 average is 39%. They are decent at making them, too, at 35%. BG has struggled to defend the 3 and they will need to be ready to do that Friday. Flipping it around, they are really struggling on defense...so maybe the system isn't coming together yet. They are easy to shoot against and don't get turnovers, a bad combination. They are good on the boards but foul quite a bit. They allow 58% made 2FGs, which is #330 in the country. Teams are penetrating...scoring 55% of their points on 2FGs. Individually, they are a young team, returning only one starter from last year. Their leading scorer is JUCO transfer Carlos Dotson at 13 PPG, 8.9 RPG and shooting 58%. At 6'7" and 265, he's a two-gapper as well. SO G Matt Halvorsen is also scoring 13 PPG, but it's rough, shooting 40% and 36%, while leading the team in assists. Fr G Kameron Gibson is scoring 12 PPG, shooting 47% and 42%. He's from Cincinnati. This is a game BG should win. They are playing well at home. They do need to defend the 3 and keep WCU from getting hot and avoid getting into a jump shooting contest, but if they get stops they should be able to win this game. It's over. Ish. For today, how's that? BG announced 17 signees today. Many of them had been on here over the past few months. Still, there were some new names on the list, which is good given the short period of time that our coaches have been here. You can read all about these guys here, see their videos, etc. Nine of the 17 players are from Ohio and then six from Michigan and Pennsylvania. Coach Pelini had noted that he was recruiting in the area during the interim period and of course Coach Loeffler has made a point of recruiting this area better. One thing...I hope we aren't writing Florida off completely. Some of our most productive players are from there. 11 of the 17 are on defense, which was clearly needed, if you happened to see us play this year. That side of the ball needs numbers and I think at least a couple of these guys might be able to play right away. We don't have any idea how these guys will evolve into players--you never do. The ratings won't be high, but that's not the issue right now. This class, on this day, is a win for the program. BG lost a couple guys in the interim period, but no more once the staff was here. Essentially, they saved the class and did a lot given the time constraints. I think the staff will recruit effectively and I look forward to next December. Pelini deserves credit. Guy is rock solid. BG has 4 scholarships left. I'm a little surprised at that, I would have guessed more. Coach is working it and did mention grad transfers. So, for now, Coach Loeffler heads to where ever it is that BC is playing Boise to finish his job there. I'm not crazy about it--seems like head coaches don't usually do that...both Clawson and Babers thought their new school was more important--but he does have a highly qualified staff here and I'm confident/hopeful that it won't impact the program's renewal. There's plenty to do--even in a dead period and he admitted it has been "challenging." So, that's the news. For today. So here it is....national signing day. The day that the fax machine has the highest level of importance in American lives....BGSUfalcons.com will have all, as will twitter. A feed is below for your convenience. We'll all catch up when the fun is done. So, signing day is tomorrow. Here's the latest from The Blade. Nothing too new here from what you would have found here over the weeks, except for the verbal from Andrew Bench of Genoa. A couple of additional notes. First, the class is thin. Loeffler has brought in one top-flight player and kept the top recruit we had from before. Beyond that, recruiting was lagging while Jinks was here and it's just not going to be a huge class or highly ranked. In fact, I think the fact that recruiting had died out was the reason Jinks had to go. Recruiting isn't over...there are players who have not signed who can sign in February. I would expect to see BG on that circuit as well. Also, don't forget in this era of college sports, there is an opportunity to get some grad transfers to use scholarships for a year while the coaching staff fires up a true recruiting effort for next December. The contacts of our coaching staff might be able to make something out of that. There's also the possibility of transfers or JUCO players, though you'd like to get a JUCO player here for the Spring. One last thing...one thing we have not heard is players transferring. They just have to enter the NCAA portal now, but I'd still expect them to use social media for some kind of announcement. We also lost guys last year after spring practice, but any idea that there was going to be an immediate flood of outgoing players does not appear to have happened. The Loeffler era has its first high-profile verbal--at least that we are aware of. This is a good one. In fact, he's the highest rated player in the class to date. His name is Brock Horne, and he's from Romeo, MI, which is kind of north of the Detroit suburbs, almost in the base of the thumb. He's a MLB and a 3-star recruit from 24/7. They rank him as the #61 ILB in the country. He had offers from Buffalo, CMU, Cornell, Dartmouth, Harvard, Iowa State, Miami, Princeton and Toledo...so this is a guy who had a lot of options. He also had a PWO from Michigan. He's 6'2" and 210 and had a very productive senior season. He had 108 tackles, 10 for loss and 2 sacks. For that matter, he was also a thousand-yard rusher, though he certainly seems to translate to a MLB in college. He was first-team All-State for Division 1-2 on defense. You have to like those Ivy League offers, because they show he's a good student as well. Based on his picture, he will compete with Caleb Bright on day 1 for best hair on the team. I'm going to guess that one key item in his decision is that BG can use LBs and there's a chance to play right away. Welcome to the Falcons, Brock. With about three minutes left in the first half, the game between BG and Findlay was what I had feared. Findlay--with a strong contingent of fans in the house--was up 9 on the Falcons, who had apparently not taken seriously Coach Huger's warning that Findlay can play. They were hitting WIDE open 3s as well as back door layups, all off a motion defense that BG was not willing to defend. BG then woke up. They scored the last 9 points of the first half and the first 7 of the second half (in 82 seconds) and then played suffocating defense against the Oilers. The lead got over 10 with 16 left and never got inside 10 again. In fact, the lead got as high as 29 and BG won 82-57 in the end. Findlay actually had played on Saturday, so that's a tough back-to-back, but BG did a nice job putting pressure on the team and showing effort on the defensive end to get the win...which is what should have happened, but had to be done. BG is 5-0 for the first time ever at the Stroh. The 2008-9 team was the last to start this way...in fact, they went 6-0. It was the second Louis Orr team and a team that went on to win the regular season title, though that's not a comparison we probably want to get too hung up on. BG hasn't won back-to-back games over 25 points since 1996-97. The wins were over Tiffin and @Wright State...that team also was a MAC Co-Champ in the regular season and played in the NIT for Larranaga's last year. Same thing on the comparisons. The best thing about the two games is that BG has found its shooting touch. Coming into the Green Bay game, BG had hit in the low 20's from 3FG for four straight games, but now BG has two straight games over 40. They won't play on the road again until they are at Kent on January 5, so we're going to have to see if the gains can translate to the road. But, for now, the ball is going in. BG ended up with 1.16 points per possession. They shot 48% from 2FG and 42% from 3FG--on only 19 attempts, which I think is part of the key. We need to be a team that attacks the rim and then makes the 3s off the penetration. If we "settle" for 3s, they don't usually seem to fall. BG took excellent care of the ball, had a good if not great offensive rebounding game and got to the line A LOT. The first half free throw shooting was putrid...6 of 14, which is bad, but then missed shots were falling off the side of the rim, bricks off the phlange...it was not good. BG did make 12 of 16 in the second half and for the game outscored Findlay 18 to 4 at the FT line. On defense, BG held Findlay to .8 points per possession. They shot 24% in the second half--with about 7 minutes left they had only 10 points. For the game, they shot 33% from 2 FG and from 3FG and took good care of the ball. BG dominated the glass at that end and, as mentioned, they rarely found their way to the FT line. Individually, Justin Turner continues to shine. He scored 22 points on 8 of 13 shooting, 5 of 5 at the line, 6 rebounds and 4 assists. Young man is a player. Also, in that 16-0 run, Turner had 10 of the points, which is something you see pretty often. He can take over. Dylan Frye was also very effective, hitting 5-5 from 3 FG, scoring 16 points and adding 3 assists. Wiggins had 14 points and 8 rebounds, so he missed a double-double. He shot 6 of 11 from the field but was 2 of 5 from the line. He played only 22 minutes due to foul trouble. Daeqwon Plowden had 9 points and 9 rebounds. Uju had 11 points and 8 rebounds, making all 3 of this FGs and getting to the line 8 times. BG's also got strong minutes from Marlon Sierra. He's a tough inside player, can shoot the jumper. He played 12 minutes, I'd suspect he'll get more when MAC play starts. BG did start Plowden and Fields again...Lillard played only 11 minutes. Next up is Western Carolina at 1 pm on Friday, which is strange. Anyway, BG is now 6-5 with 2 non-D1 wins. The Findlay Oilers come to town Sunday. On paper, this might appear to be a win day for BG--and it should be--however, Findlay is no joke as a DII program and if BG comes in and does the zombie routine then the Oilers will make BG look very bad. Just to recap it, Findlay has made the DII Sweet 16 the last two years. They've made the DII tournament 14 times and won it in 2009. They were picked to win the Great Midwest this year in the preseason, and they're off to an 8-1 start. They are the #14/#20 ranked DII team right now. For common opponents, they beat UT last year (as compared to BG??) and both teams have a common win over Tiffin. This is no guaranteed win game. This is one of BG's oldest opponents. This is the 72nd meeting in a series that started in BG's first season of basketball. They played twice that year...BG also played EMU and UT from the current schedule. BG is 55-16 in the series. The teams have played only 3 times since the early 90's, and Findlay beat BG in 1991. We don't have the usual statistical breakout, but here are a couple nuggets. There are 305 teams in DII, for reference. So, you can see a team that shoots well and takes very good care of the ball, while being perhaps a little more porous defense. Individually, they are led by Alex White, who is averaging a double-double. He's a 6'7" SR averaging 18 and 10 with 6 double-doubles, 10th in the nation. He's a 48% shooter and is #11 in blocked shots. Next is Aaron Overhiser, a 6'7" JR. He has 16 PPG and 6 RPG on 54% 2FG shooting and 58% 3FG shooting. Trey Smith is a 5'11" Sr. G who is shooting 47% and 43% and scoring 12 a game. Tommy Schmock has 6 assists per game and is #25 in the nation. He's a 5'11 SO from Cleveland St. Ed's. This is a good team that is well-coached and used to winning. If BG comes into this game thinking this is an easy win coming out of finals, Findlay will get the win. BG has played well at home, let's hope they bring the focus to this one and get the W.
Based off today's Men's Basketball NET rankings -- here's the average ranking for the Top Ten conferences in the nation. So, a quick MAC check-in while the conference takes a break for finals. The MAC is off to a very good start...as noted in the tweet above, the MAC is the #9 conference in the NET rankings...the NET is the new RPI...and is 11th in Kenpom. That's pretty good. The MAC is almost always in the Top 13 or 15, but this year the league has a number of teams off to good starts. Below is the current ranking for all the teams on KENPOM and Net. As you know, there are a million ways to measure all this stuff, and there are clearly differences here. One way NET was supposed to be better than RPI was that it was going to take margin of victory into account, which kenpom does. Anyway, the clear leader to date is Buffalo. Reigning champs, beat Arizona in the Big Dance, has a win @WVU this year, ranked #14 in the AP Poll and #15 in the Coaches. Right now, they would end up with an at-large bid, but there's a long way to go. The MAC has two teams in the top 100, which is unusual at this time of year. Toledo is 9-1 and ranked in the mid-70s. In fact, based on NET the MAC has four teams in the top 100, counting Ball State and an 8-1 Kent State team (weakest schedule in MAC but a big win @Vanderbilt). Groce seems to have Akron rebounding ahead of schedule and OU is also off to a 6-3 start. No one in the conference has a losing record. Not CMU, who has shown the ability to rack up big numbers against terrible schedules--#335 out of 351. Meanwhile, EMU is off to a rough start. They are 5-5 with 3 non D1 wins. They have lost to 3 top 100 teams, including Duke, but also to Detroit (294). They were picked to win the MAC. They play a really good UC-Irvine team on Wednesday in Ypsi...a team Toledo beat, so that could be an interesting test. Anyway, right now this is looking like a very competitive conference. You'll note that BG is 11th in Kenpom and in NET. This isn't looking like a year to be down in the MAC, especially in the East. BG's going to have to show some improvement. We will check back on this right before conference play starts, but for now the MAC is having its best basketball season in years. That always makes for an entertaining new year, but puts pressure on BG to get things put together or risk being left behind. A couple pieces of news on football. First, the team has a verbal. This is a preferred walk on (PWO) and he's a kicker. He plays at Rochester Adams HS, which is a north suburb of Detroit. Just a hunch, with the late recruiting start you might see more PWOs than normal as BG starts the long process of rebuilding its roster. He seems to have been a productive kicker, though we don't have a ton of info. A lot of scouting of kickers takes place at camps, so maybe it was that as well. He was also offered a PWO by Toledo, according to the link above. Anyway, BG had a kicking crisis this year--and it worked out OK, Needham didn't get many chances but made them OK and kickoffs were fine--but some attention to kicking is vital, especially if we're going to play a more pro-style game. Anyway, welcome to the Falcons, Ben. The second thing is that the BG/Jinks transaction is done, based on this from Jordan Strack. BGSU has reached a settlement with former football coach Mike Jinks for $375,000. That ends his contract effective immediately. That will serve as the buyout for his termination. Originally, it was based on his ability to find another job. This takes the place of that clause. Ended up being way less than it had been built up to be. It is among the costs that came with that hire. Anyway, we should be looking forward now. What's done is done. Defensive rebound rate: #8 (from kenpom, number of rebounds based on available rebounds). His 19 rebounds in the last game is tied for #7 in the country this year. He started the year with 704 rebounds. With 129 this year, he is at 823, moving from #10 to #6. For you old-timers, he passed Rex Leach, Anthony Stacey, Al Dixon and Ron Hammye. One note, just for context. Total rebounds is a stat that is biased toward current players, who play 4 years and more games. When Cash played at BG, freshmen weren't eligible. Even with his big numbers this year, Wiggins is not in the top 10 for rebounding average--he stands at 7.9 and #10 is at 8. Cash averaged over 13 rebounds a game in his BG career. Anyway, Wiggins is off to a big year, the biggest year we've seen statistically for quite some time. Enjoy watching. Coach Loeffler filled out his coaching staff this morning, and one of the hires is a WOW. Brian VanGorder will serve as Associate Head Coach and the coach of the linebackers. This is a guy who has been around the block. How does 38 years in coaching sound? How does being DC at Louisville, Notre Dame, Auburn and Georgia sound? Broyles award winner? Or being a Head Coach at Georgia Southern and Wayne State? Or five years as DC of the Atlanta Falcons? I think that would sound good. He'd be the most seasoned DC we ever had...and he isn't even the DC. The final coaching spot is Julian Campenni, who will coach the d-line. He has been a graduate assistant at BC and joins Coach Adazzio in the mix as younger coaches. Nothing wrong with a mix...for example, Campenni has Van Gorder and Pelini to lean on and learn from as he develops the defensive line. A couple other adjustments were made. Erik Campbell, WRs, will also coordinate the passing game. And Jacob Schoonover, who had previously been announced as the LB coach, will be the special teams/linebackers coach. He worked with special teams at Illinois State. So, all ten of the guys are in house. I think BG fans should be happy with what we see. The first step in a new coach's tenure is to hire the staff, and I think he's done a good job on paper. One note. If you check the Internet, it is pretty clear that a lot of the fans of schools where Loeffler has been OC don't have fond memories and basically think it's a joke that he's an FBS Head Coach. I guess I have a couple responses to that. First, Tennessee fans told us that about Clawson. Second, when you look at the staff Loeffler hired, which of these things do you see? A. A guy who's thinks he knows everything he needs to know and doesn't need to get better. B. A guy who understands the challenge ahead of him and has chosen a staff to compliment what he is good at so the program can succeed...a guy with either the humility or the drive to surround himself with good people. It's B. So far, I like how things are going. Nothing will guarantee success, but we're moving in the right direction and I'm excited to see what this guy...guy B...can do. Well, of all the things I expected to see yesterday at the Stroh, a blow out win was not one of them. BG, which had two straight poor to very poor road losses, came back at home and played its best game of the season to beat Green Bay. BG won 97-68 and the outcome was never really in doubt. In fact, Green Bay never led. With about 8 minutes left in the first half, BG was up 20-14. Over the next four minutes, BG went on a 13-6 run to inflate the lead to 13. BG kept it rolling and led 49-29 at halftime, meaning over the last 8 minutes the outscored the Phoenix 29-15. In the second half, BG did what they had to go, which was to prevent any kind of comeback. The lead never got inside 18 and BG led by as much as 35. It was a remarkable game. BG had their best game of the year on both ends of the floor. BG is a much different team at home so far (undefeated) and a much different team when they are getting stops and playing in transition, an observation echoed by Justin Turner and Coach Huger last night. As advertised, it was a fast game, with 81 possessions. BG scored 1.2 ppp and allowed .84, both of which were season highs in D1 games. The only comparable offensive performance against decent competition was last year vs. WMU. 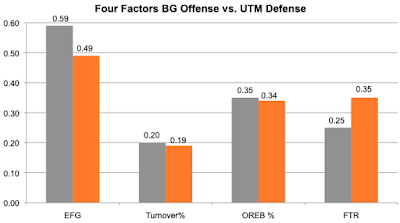 The defense was also as good as a couple of BG's non-D1 opponents last year. BG held GB to 40% shooting on 2FGs and 32% 3FG shooting. In comparison, BG shot 64% from 2FGs and 41% from 3FG. That's going to win you games. That's as compared to the national average of about 50% EFG%. BG did have some turnovers, but dominated the boards on both ends and got to the line more. BG was 19 of 39 at the line, which is 69% and about average while GB was only 13 of 24. There were 45 fouls called. Hard to put to fine a point on this. BG dominated both ends of the court and this is a decent team. They gave Belmont their only loss, beat NIU (a team picked ahead of BG in the MAC). They battled Oregon and Iowa tough. This was a good opponent. Obviously, you're going to see some individual performances buried inside that. Justin Turner was just spectacular. He scored 25 points, shooting 8 of 14 from the field with 6 assists and 1 turnover. He was 7 of 9 on his 2 FGs and 8 of 10 at the line. He was very efficient. He's so effective finishing at the rim, it would just open so much up. There was one play when he went coast to coast into three guys at the rim and scored with the foul. He's just a sophomore and I think he's playing better this year than last. Wiggins double-doubled in the first 10 minutes of the game. He ended up with 12 points on 4 of 7 shooting and at the line. He added 19 rebounds, the second most of his career. BG got really good minutes out of Fields, Laster, and Sierra. Sierra was especially good with 7 points and 8 rebounds in 20 minutes. He can handle the ball and shoot from outside as well as play inside. Not sure why he's not getting more minutes in general. Matiss made 2 3FGs in 6 minutes. BG started Fields, Plowden, Frye, Wiggins and Turner for the second straight game. Anyway, right now it appears that we have a team that plays well at home and struggles on the road. The next three are at home and very winnable. BG's goal needs to be to hit the MAC season at 8-4, when we open @Kent, the surprise pre-season team in the MAC. Once BG is on the road again, they're going to need to get some consistency. The frustrating thing is that you can see some ability and a critical mass of players. You figure, you take the starters and mix Lillard, Matiss, Sierra and Laster in, if they were playing effectively for longer stretches of time, you could be OK.
You just don't see it all come together very often, and when its bad its pretty bad. A couple of quick news hits from the recruiting front. BG has lost a couple of members of its incoming class, which is not a surprise. Logan Holgorsen, the highly-rated QB from Morgantown actually switched his twitter profile a while ago. Holgorsen and his father all tie back to Lubbock, so it isn't a surprise. If I had to guess, Texas State, which is where the WVU OC is head coach now, would be a likely landing spot. By the way, Jordan Strack has reported that he will not be coming to BG. The other is Josh Moore, a JUCO WR who committed last June. He cites "unforeseen circumstances." No idea what went on. There was a tweet from a Josh Miller who is (and I assume now the word was) BG's Assistant WR Coach who apologized for BG deceiving Moore in some way. No idea what the worst is, but Moore won't be coming to BG. One good thing is he is a December grad and could have been at BG learning the system early in the Spring and our WRs have been thin. Anyway, best of luck to Josh and Logan. So, the beat goes on. BG faces a pretty tough test Saturday against the Phoenix of Green Bay. Formerly Wisconsin-Green Bay, this team has a pretty good basketball tradition that had fallen on some tough times...but seems to be turning it around this year. They won 20 games in 2014, 15, and 16, playing in the NIT the first two of those years and then in the NCAA in 2016. They were 18-13 the next year and fell to 13-20 last year. This year, they were picked to finish 4th in the Horizon, which is higher than two teams BG has already lost to (albeit both in road games). BG beat them on the road in OT last year. This year, the Phoenix are off to a good start. They are 5-3 with one non-D1 win. They beat NIU and Belmont over the past week in Green Bay...the Belmont win, in particular, is significant. In addition, their losses are to Indiana State, @Iowa and @Oregon, so they are without an especially bad loss. The first thing to know is they like to play fast. They are #11 in the country in number of possessions (that Belmont game must have been something to see). BG likes to go fast, too, so this could be fun to watch at least from that perspective. Green Bay is right on the national average for points per possession, while BG is below average defensively. Green Bay is also below average defensive (1.03) but they are closer. BG's offense is very poor to date. BG is #234 in offensive efficiency. So far as that goes, look how evenly matched the GB offense and BG defense are. Pretty much, BG allows what Green Bay is used to getting. GB shoots well. They don't try a ton of 3FGs, but they are effective at making them and are above average from 2 FG. They take good care of the ball and average getting to the line. They are almost exactly as bad shooting FTs as BG is. You'd have to expect that they might work the 3FG more into their attack, given BG's issues, but then again the game might largely be played in transition. As noted, BG's offense has been poor. BG is very good on the boards, but well below average on every other measure. Other than giving up a lot of FTs, Green Bay is effective/average or better at every aspect. They are very good defending the 3 (#66) but in the bottom 100 in the country at defending the 2FG, which is where you'd like to see BG focus to try and prop up the FG shooting that is making it difficult for them to win. Individually, they have 3 players scoring 14 a game. One is JayQuan McCloud, a second-team All-American JUCO player. He is very efficient, shooting 49% and 41%, and usually comes off the bench. Second is ShanQuan Hemphill, who played at Florida Southwestern for former BG staffer Marty Richter. He's 6'6" and shooting 61%, all of 2FGs, horrible at FTs. He also averages 5.3 rpg. Third is Sandy Cohen III. He is a Marquette transfer who opened his GB career by scoring 16 and grabbing 6 rebounds vs. BG last year. He's also 6'6", shoots 45% and 36% and leads the team with 6.8 RPG and over 6 assists per game. He is all-Horizon pre-season. Lastly, 6'8" Manny Patterson average 8 ppg and 6 rpg in about 20 minutes per game. He played in foul trouble a lot against BG last year. This is a pretty experienced team and much different than the team we played last year, with the two JUCO players. They are playing pretty well. BG has played better at home, but this is the best non-conference team we will see at home and if the effort isn't any better than the last two games, Green Bay will this one. So, while there's a lot of excitement about the Falcon football team, hidden in there is a continuing malaise in the men's basketball program. The Falcons lost their last 6 last year and are 3-5 in D1 games this year, making it 3 wins in the last 14 games. Last night's loss was an 18-point loss to a 2-7 Cleveland State team and just has to rank as very disappointing. There was no energy on BG's side. Coach Huger said they were walking around like "zombies" after the game...by which I mean he said it after the game but the zombie walking was during the game. BG started out hot and had an 11-point lead in the first half. Then, CSU switched to a match-up zone and that seems to send the Falcons into zombie mode. Coach said we were getting the looks we needed and just missing shots, but then there's that zombie comment and you don't really know where that falls out. It's the second time that BG has completely fried when facing a zone this year. The offense went south and then the defense joined it. Coach wants to say we attack the zone well, but this team's continuing inability to attack a zone defense has to reflect on the coaching most of all. He simply should be able to prepare to beat a team playing a zone, especially a team like CSU that doesn't play one ordinarily. Huger himself said it wasn't a good zone. Coach did try to shake up the starting lineup. He started FR Caleb Fields in place of Lillard and Plowden in place of Uju. Also, Michael Laster was a DNP. 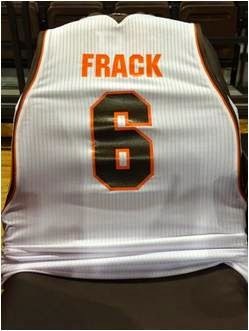 No idea, he might be injured, but when they needed a PG to spell Frye, they went with DeAndre' Austin. BG had a putrid offensive night. Remember that CSU was allowing 1.08 points per possession coming into the game...BG scored .92. BG shot 36% EFG, its lowest of the season, making 38% of its 2FG and 22% of its 3FG. Those are just unbelievably bad. Over the last four games, BG is 20-93 on 3FGs. BG did take good care of the ball, did well on the offensive boards, but didn't get to the line very much and shot FTs poorly again. That was complemented by an equally bad night on defense. CSU, a struggling team, scored 1.18 per possession. They allowed 63% EFG. Both numbers were BG's worst game of the season. CSU made 50% of the 2FGs and 50% of their 3 FGS. As of this morning, BG is #333 (out of 351) in defending the 3. Coach was rough on his defense and there was a little back and forth about whether missing shots or not getting stops is worse with Todd Walker. I will say this. Our team is horrible in half-court offense. They need stops and transition to score points. Individually, really only one Falcon had a strong statistical game and that was Wiggins. He scored 21 points in 26 minutes, shooting 7 of 14 from the field, 7-9 from the line, adding 16 rebounds and no turnovers. They offered him space to operate in the zone and he took advantage of it before foul trouble limited his minutes. Justin Turner scored 16, but it was a rough night. He shot 6 of 18 and 2 of 7 to get there. Not to put too fine a point on it, but BG's other starters were 5 of 21 shooting. Matiss came off the bench to score 9 on 4 of 7 and 1 of 1 shooting, and 6 rebounds in 13 minutes. If he's up to it physically, you'd like to see him in there more, too. Anyway, the team is not better than we expected right now. In fact, they are probably worse. Next up is a pretty decent Green Bay team that is 5-3 and beat NIU and Belmont in its last two games. Let's hope they play man-man. I know that there was some chatter during the season about the lack of progress our defense made in its first year under Carl Pelini's coaching. I wanted to make a couple of points about that. First, even as Eliano was being let go, we knew that BG had a lack of talent as well as a lack of good coaching. The biggest complaint was the defense never seemed to improve and that's certainly a fair description. The problem became worse with off-season transfers and dismissals as well as serious injuries to Konowalski, Murphy, Pence, Belton, Walder, etc, and lesser injuries to Croslen, Brooks, etc toward the end of the year. It just wasn't going to be night and day given all that. With that, the defense did improve. Yes, from among the worst to merely bad, but the defense did improve. As you can see, in MAC play, BG gave up 4.2 points fewer per game and .6 yards fewer per play, moving to 9th in both categories. BG moved up to 11th in rushing yards per carry allowed and held ground in pass efficiency defense and 3rd down defense. Again, not claiming this to be a stratospheric leap. Just saying that its very possible the 18 defense had less talent than the 17 defense did and there was coaching involved even in this modest increase. In contrast, despite having people back and relative health, BG's offense scored 6.5 fewer points per game and fell from 7th to 9th. St. Francis Tight End Joey Carroll has committed to BGSU. He’d been committed to Toledo for a long time, but it didn’t work out. Scot Loeffler has his first recruit on board. Joey Carroll will go down as the first verbal of the Loeffler Era. He's a big young man who is also local, which apparently is something we're going to focus on. He had offers from Toledo, Army, Colgate, EKU, EMU, WMU and Youngstown State. Some notes. Here's the story in The Blade when he committed. The recruiting people in the story say he is an "on-the-ball" TE who can also run in the slot and catch passes. He was second-team All-TRAC. There are also stories listing him as big at 6'7". Didn't find much from him in the way of stats. He joins Presley Motes, Julius Van Rooyen, Tyler Traylor and James Lachey as TEs at a position where I believe there is immediate playing time available. So, the Cleveland State Vikings are next on the schedule. This is an opportunity for BG to get a road win, that's for sure. CSU is 2-7 this year, with wins over Urbana and #342 South Carolina State. They lost to #222 Samford and #210 IPFW at home, as well as @Toledo (by 12) and Kent at home (by 4). They also pressed DePaul, trailing by 4 with the ball in the final minute of the game. They were picked for #6 in the Horizon by Blue Ribbon and #7 by their own media. With that said, BG has already lost to the team picked to finish last. They were 12-23 last year and 6-12 in the conference. A #8 seed, they made a run in the Horizon tourney and almost made it. They lost 3 starters and a key reserve from that team and have six new players. Their coach told Blue Ribbon they were "starting over." Kenpom shows them to be one of the 30 youngest teams in the country. Tempo-wise, we can hope for an up-paced game. BG and CSU both move at 72 possessions per game. It won't be surprising to know that CSU has not been good on either side of the ball. Looking first at their offense, they are scoring .97 PPP, which is really bad. National average .93. They are just as bad on defense, allowing 1.08 PPP. They are ranked #286 in both on kenpom. When CSU has the ball, you see why that all is. 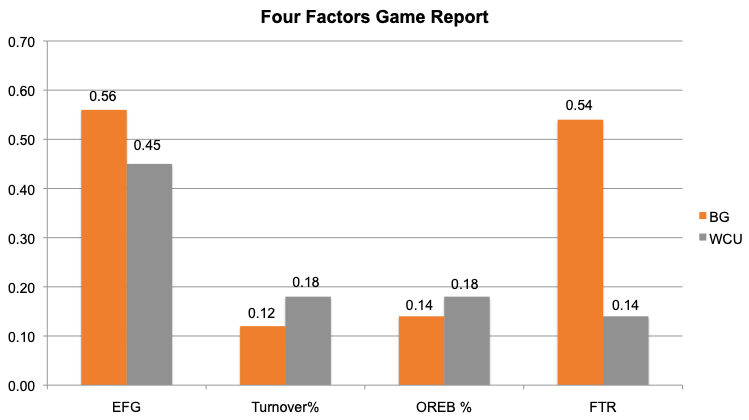 They shoot below national average, but turn the ball over more than average and poor offensive rebounders. They do a good job getting to the line, but are poor FT shooters at 65%, though not as bad as BG (63%). 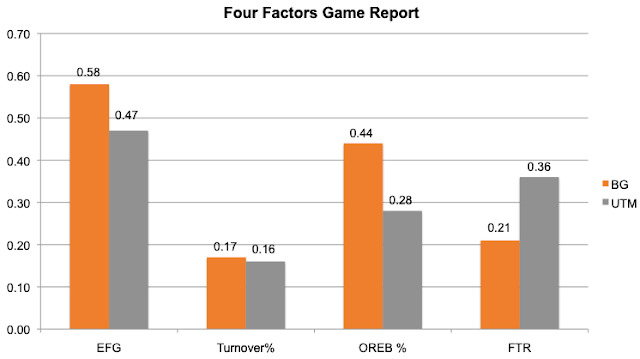 They love the 3--43% of their FGs are 3FGs--but make them 34% of the time, which is just a little bit above the average. They only make 48% of their 2FGs. That would all be comforting except for BG's difficulty defending Hartford, who unleashed a similar attack against BG Saturday. In fact, BG is #310 in the country defending the 3FG. Also, BG does not force turnovers so it will be interesting to see if CSU can handle the ball against us. On the defensive side, they are bad at everything. They are easy to shoot against, don't turn the ball over, can be beaten on the boards and allow a lot of FTs. They defend the 3 very effectively but don't defend the 2FG very well. This should be well-suited for BG, unless we try to match their jump shooting attack, which seemed to be what happened in Hartford. Teams are going to pack in on Wiggins but jumpers aren't the only answer to that. Also, BG is not set up to take advantage of their tendency to foul. Their top player is Tyree Appleby, who is a SO returning starter. He's scoring 14.7 per game on 41% and 33% shooting, which is not terribly efficient, but somebody does have to shoot the ball. He has 40 assists (4.4 per game) over 34 TOs. Their other double-figure scorer is Stefan Kenic, a 6'9" Serbian scoring 10.4 on 43% and 38% shooting. Their leading rebounder is 6'7" Jalaam Hill, at 6.1 per game. He's a JUCO transfer. They also have a FR 6'6" guy named Seth Millner, who is scoring 9.6 per game and shooting 47% and 50%. They play a deep rotation, with 10-11 guys getting in most games and the most-played player topping out at 30 minutes a game, something to keep in mind when you look at the stats above. This is a game at the start of the year you would have expected BG to win. I wouldn't be shocked if BG won but it's far from something that can be counted on, given how BG has played in other games. The Football announcements keep coming. Seven assistants and a strength coach were announced yesterday. Today, the school announced that LaMarcus Hicks will return as secondary coach. BG has kept three coaches from the previous staff, all on defense: Pelini, Schoonover and now Hicks. Two coaches remain to be selected. One is the d-line and I would suspect one is a special teams guy. The previous staff broke CBs and S out seperately, but Hicks is announced as secondary. Anyway, it will all be revealed soon enough. For my money, Pelini just picked the defensive staff a year ago. If he's going to lead the defense, then it makes some sense you'd retain the assistants if they're happy and you're happy. BGSU announces secondary coach LaMarcus Hicks will return. CBs coach DJ Gomes and DL Coach Jimmy Williams were not retained. A few more positions to fill for Loeffler. Coach Loeffler announced his first round of assistants and showed that he is committed to building a program...starting with his staff. The University also showed that it understands what was wrong with the Jinks staff, because every bio of one of the new assistants highlights his experience as a coach. 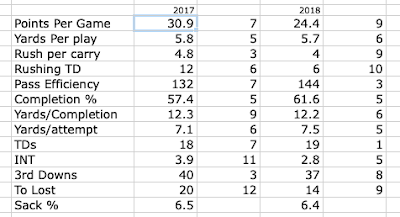 There's also a tabulation floating around that says the staff has an average of 22 years (or something) of coaching experience. You can see the full story here. Here is a summary with some general thoughts. First, Loeffler, as expected, cleaned house on the offensive side of the ball. All of the original Jinks assistants are now gone. This includes Seth Doege, whose brother is our QB. On defense, Loeffler did keep Carl Pelini. I'm happy with this because I think he's a good coach and a former head coach and he provides some depth on the defensive side of the ball that Loeffler does not have. For those of you who think Pelini did an awful job with the defense this year, I will have a post up on that in due time. When we get some players, Pelini will coach a very solid defense and the players respect him. The only defensive coach retained right now is Jacob Schoonover, the LB coach. The d-line and D-backs coaches are not known at this time. The biggest news was Terry Malone at OC. This is his second stint in that job. He was here from '86 to '95. He has coached all over the place, including at UM, Purdue, the Saints for Sean Payton, etc. He was at WMU when he took this job. He's got experience and ability. He will also coach the line, which I contend was the most poorly coached position group on our team over the last three years. He's done enough to provide Loeffler with the support he needs as a new head coach. The RB coach is a guy named Chris Hedden. He has coached all over the place, including being the head coach at St. Francis. He's currently OC at Trine, a DIII school in Indiana. That team has a RB who is a semi-finalist for the DIII player of the year award and is #4 in the nation in rushing. He was also an assistant at UT for 8 years. Erik Campbell will coach the WRs, after a 30 year career, much of it in the Big Ten and some in the CFL. Max Warner will coach QBs, as I noted yesterday. The TE coach will be Louie Addazio. The son of BC Coach Steve Addazio, he's a GA at OSU right now. And the strength coach, Kevin Tolbert, was at UM for the last 3 years and will SF and Stanford before that, as he moved along with Coach Harbaugh. So, here's the thing. Coach said that he was going to find the best staff in the country, and I think he's done a great job putting a team together and doing it fast. Clearly, this was not the first time he had thought about it. The only guys without collegiate assistant coaching experience so far are Warner and Addazio. That's in contrast to the last staff, for sure, where most of them had a resume like Addazio's. And not to say Addazio won't be a good coach. He grew up around it, worked at OSU, etc. Just saying that instead of having a full staff of people like that, he's the only one and can continue to learn from the other coaches. I think BG fans will be happy with this staff. The last two positions remain to be filled, but the opening announcement of the Loeffler Era shows a coach who's prepared and ready to re-build this program. So, a quick football update. All year, I've been looking forward to NIU and Buffalo in the MAC final. These were both really good teams, well coached and I felt it would be an excellent matchup. And it was. Buffalo seemed to have it won, but NIU mounted a furious comeback to take the title, 30-29. Rod Carey has clearly been underrated as a head coach. They were off last year, were predicted to win it this year and they did. Meanwhile, Lance Leipold has the Buffalo program loaded and ready to compete, and we know he's used to sustaining success. The bowl bids are also out. In all, 6 bowl games will include MAC teams. Miami was the only bowl-eligible program to not make it, and they were 6-6. Overall, the matchups are not bad. As normal, the MAC is matched up with G5 programs, not P5 programs, which I think would be everyone's preference. For example, the NIU/UAB game is interesting because UAB won their conference and therefore it is hot champion-on-champion action. Toledo will take on Florida International, QB'd by former BG QB James Morgan. WMU and BYU is a good matchup--BYU is a name opponent, though they are deprived of a trip to the warm weather. Also, all 3 are non-Sun Belt games. EMU in a bowl game is interesting just because it is. So much credit for what Chris Creighton has done there. Also, Georgia Southern was 9-3 and play the same soul-crushing running attack they did when they embarrassed the Falcons in '15. And Sun Belt. I'm sure Buffalo would rather not be playing a Sun Belt team, but Troy is a good team with a strong historic program. They were 9-3 as well. In addition, they are playing near home. Ohio might have the easiest game. San Diego State was only 7-5 but the game is a long way from home. The bowl games are pretty much silly, given the number of teams that make them. I felt that more strongly when BG was making them on a regular basis. Anyway, I like to watch these games and I look forward to seeing how our MAC brethren do and I look forward to seeing our program back on this list. There's a couple updates on the football program. First, courtesy Thomas Schmeltz, BG's QB Coach has been selected and has quit his previous job. His name is Max Warner. He has been a high school head coach for three years and was a quality control assistant for Virginia Tech for one season, where he undoubtedly ran across Coach Loeffler. He was at Bloomingdale HS in the Tampa area, where he was 24-10 as a head coach and gave that high school its first ever three straight winning seasons. He is their all-time winningest coach--by NUMBER OF WINS--after only 3 seasons. Boston College is playing Boise in a bowl in Dallas and Addazio has been quoted as saying that he expects Loeffler to call plays in that game. Not going to lie, both of these are giving me some disturbing feelings of deja vu of the kind of things that went on during the last transition. The staff needs to be judged in total, but if we don't end up with experienced college assistants I think we'll all be pretty disappointed. And Jinks said that coaching Texas Tech in the bowl game was a mistake he made before his first BG season, saying that it cost him valuable evaluation time. It is during a dead period, recruiting wise---the game is the day after Christmas. The Falcon MBB team had a disappointing result Saturday in Hartford when they lost 76-63 to the Hartford Hawks. The Hawks were 2-6 coming in and the oddsmakers had this one as even when it tipped, but in the end, BG lost a game they could have won to a team that would probably be in the lower half of the MAC. It pairs with the Detroit loss to give BG 2 losses to teams with over 200 kenpom rankings and does not lend any hope to the idea BG will exceed expectations this year. Hartford led for almost all of the first half, going up by as much as 14 and leading by 9 at the break. They were back up 40-27 in the second half when BG went on a 14-0 run to take a 1-point lead with 11:00 left. And then, Hartford proceeded to score 36 points in the final 11 minutes against BG's 22 to get the easy win. They led by as much as 17 in the final minute of the game. Giving up that many points in 11 minutes is going to make it difficult to win any game, particularly when its the last 11 minutes. BG falls to 4-4, with 1 non-D1 win. 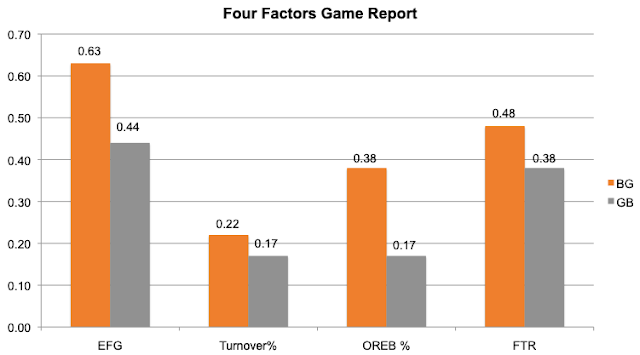 It was a slow-paced game at 67 possessions, which was the second slowest game of the season for BG. The Falcons had a poor offensive game at .95 points per possession. When you shoot 43% overall and turn the ball over on 27% of your possessions, you will have a hard time getting enough points to win. 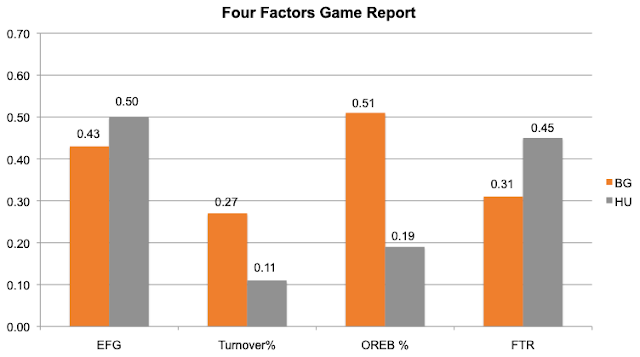 BG was effective at 2FG, shooting 55%, but made only 7 of 32 3FGs...that's awful on two fronts. First, it's 22%. It's also a huge amount of the overall FGAs...BG hasn't tried 32 treys since the 2017 season and this was a slow-paced game. In fact, I believe my preview said that BG would be in trouble if they were jacking up 3s against a team that was struggling to defend the 2 and that was just what happened. Hartford didn't do anything special with field goal shooting...that's right on the national average. They took really good care of the ball, though, and then got to the line for 24 FTs. The Hawks were outstanding...making 23 of those 24, while BG was poor, making only 10 of 19. (BG is currently #313 in FT% in the nation). And that was the difference in the game. Individually, Demajeo Wiggins got himself over 1,000 points for his career. He double-doubled, but was not effective. He scored 11 on 3 of 7 shooting and 5 of 8 from the line to go with 14 rebounds. He also had 6 turnovers. Justin Turner had 17 points, making 7 of 15 overall but only 2 of 7 from 3FG. Dylan Frye had 10 on 3 of 9 shooting---all 3s. Five players--Uju, Matiss, Lillard, Laster and Plowden--were 9 of 29 and 2 of 16 from 3FG. Frye and Lillard also had 3 turnovers each. Anyway, not that it should have been a slam dunk win, but it was certainly a disappointing loss that does not bode well for MAC play. They have another winnable road game coming up against Cleveland State in a couple days and we'll continue to watch to see BG begin to upgrade its play. Hartford in December....it's like poetry. 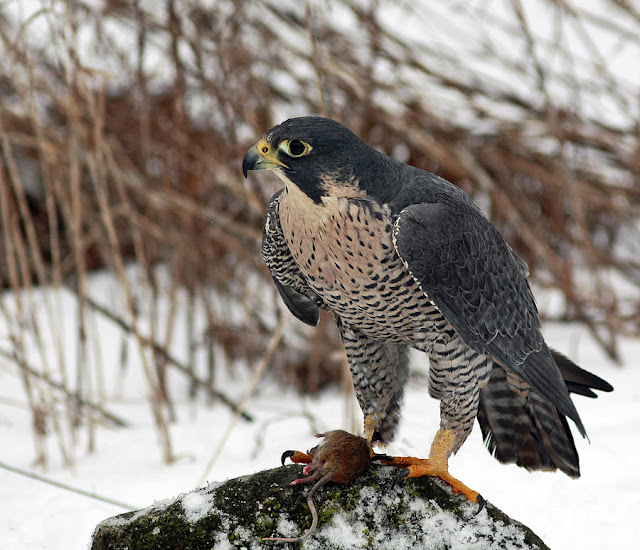 The Falcon MBB team will find itself playing the Hartford Hawks Saturday in Connecticut. They play in the America East Conference, which is the #23 conference. It is also the UMBC conference. They are picked 2nd in the conference by Blue Ribbon and the official conference poll. They return 4 starters from a team that was 19-14 last year and played in the CIT. The year before that they won 9, so this is a team with some serious momentum. It was the most wins in program history and they extended their coach's contract. This year they are struggling a little bit at 2-6, with wins over Quinnipiac and a non D1 school, and meaningful losses to Central Connecticut, Iona and Utah Valley on a neutral floor and then Tuesday night to @Sacred Heart, one of the lowest ranked teams in D1. After BG, their next game is Cameron Indoor. So, this team is not playing very well and needs a win. Stylistically, they play at 70.4 possessions, just slightly above the national average. They are a high-volume 3-shooting team and are about average at making them. They are scoring 1.01 per game, which is below average--as they are on everything on the offensive side. They shoot FTs very well. On defense, they're giving up 1.06 per game. They allowed 98 to Sacred Heart. They do force some turnovers, but they are easy to shoot against (especially the 2FG) and poor on the boards. Teams don't shoot 3s against them, which we shouldn't either. They are led by 6'8" Irishman John Carroll. Other than having a college named after him, he is scoring 18 PPG on 45% and 45% shooting, which is OK but not great. Shoots a lot of 3s. He averages 6 RPG. Sr. Jason Dunne is scoring 14 PPG on 35% and 40% shooting. His A/T ratio is underwater. Sr. G JR Lynch is scoring 13.4 on 38% and 24% shooting, which is a rough way to go. He leads the team with 3.9 assists. Finally, Aussie George Blagojevic scores 12 PPG on 5% shooting and a team-high 7.1 RPG. Below 50 from the line. Last things. According to the Kenpom measure, they are the team playing the most experienced lineup in the country. They also have SIX players born outside of North America. This is a pretty even game that Hartford is being picked to win. Let me say this. If you see BG attacking the basket, they should win this one, but if you see them pumping up jumpers than I think the Hawks will get it done. Look, these things are pretty much the same every time. Sadly, we have become familiar. There's optimism, lofty goals, high principles, talk of championships, etc. That always happens. First, it is 100% evident that this is a huge moment in the life of Scot Loeffler. This is clearly a dream he has had for a long time and he's here now and he's landed in a spot where there is nowhere to go but up and where there is a chance to be a Champion. I say that because of two observations. First, he appeared to tear up when thanking his family for their support. Second, he was evidently VERY nervous during his talk. I don't say that to be critical. He was nervous because of how important this is to him. We've got a guy who has worked for a long time to be handed the keys and he knows how important this is. He isn't coming in thinking he's bigger than the job. He's lucky to have this opportunity and it showed. I don't know if he'll win or not, time will tell. I like a lot of things about him and I like that he cares enough about being here to be nervous about it. We'll watch the next couple weeks, as the staff is brought in and any last recruits are landed. Nick P said he has a reputation as a workaholic and asked him if he could delegate. Of course, Scot said he could, but for right now, he's it anyway, so work away. Moose said that he hopes not to see his recruiting company again for 10 years. I'll add this as a Fan. Let's not have another new coach introduction for 10 years, either.